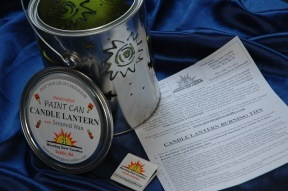 Our original Paint Can Lantern is made from a gallon Paint Can! A pattern/scenery is hand torched around the lantern. 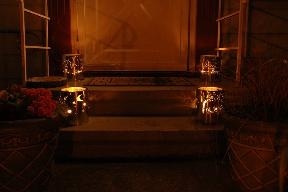 Where the metal is missing the candle light will shine through like an luminary. They're filled with 3 lbs. of scented wax & 4 wicks (burn 1 or 2 wicks at a time). Includes logo lid, our company matches & burning instructions. They are used outside and can last up to 50+ hours, when you alternate wicks as you burn. Never burn all 4 wicks together. We offer Lantern wax refills in an assortment of scents. They make unique gifts for campers, for parties/celebrations, gardeners and backyard enthusiasts. Our 'tin" paint can lanterns makes the perfect gift for someone celebrating their 10th wedding anniversary !! If interested in custom designs, contact us directly by email or phone. Exact duplication of artwork is impossible because each lantern is hand torched and one-of-a-kind.